Title: 'Comitatus Cantabrigiensis, vernacule Cambridge Shire'. Original outline colour, the armorials & cartouches coloured in full. 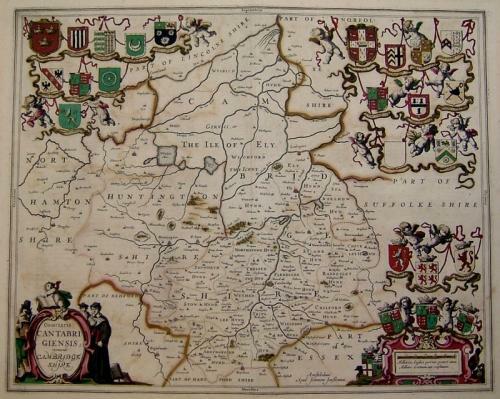 Map of Cambridgeshire, with the title cartouche depicting a scholar and 23 armorials of both local nobles and colleges. The condition is good although there are two paper cracks in the oxidised green areas of the map. some soiling as is visible in the image.